Dr. Andreas Azarko graduated from the University of Alberta in 1990 after earning his Bachelor of Science degree and Doctorate of Dental Surgery at the age of 21. Following graduation, Andreas entered into private practice with his older brother Dr. Enrico Azarko, establishing Azarko Dental Group. Since this time, Azarko Dental Group has grown into a well respected group practice with numerous dedicated doctors, in both our West and Southbrook locations. Over the years, Dr. Azarko has enjoyed being a part-time Clinical Teaching Instructor in the Faculty of Medicine & Dentistry and has devoted countless hours to continuing education. Clinical areas of interest have been in the rapidly advancing fields of cosmetic, micro and laser dentistry, with a special passion for Invisalign clear orthodontic treatment. Having successfully completed upwards of 180 Invisalign cases over the last several years, clear orthodontic treatment has become Dr. Azarko’s primary focus in dental practice. Andreas has also undergone extensive continuing education in the provision of general dentist comprehensive orthodontic treatment. Combining the clear advantages of Invisalign with fixed braces on the most difficult cases, Dr. Andreas Azarko is excited to offer the benefits of both modalities. Most recently, Andreas has brought complete digital integration to Azarko Dental Group including iTero digital scanning, digital x-rays and chairside computer integration as part of our transition into a paperless treatment facility. Dr. Azarko is an active member of the community, supporting numerous local charities including the Goodwill Industries of Alberta, the Cross Cancer Institute and Make a Wish Foundation. Outside of the practice of dentistry, he enjoys culinary experimentation, water sports, skiing and maintaining a regular exercise program. Dr. Azarko has a diversified interest in dentistry performing a wide range of dental procedures including surgery, root canal therapy, and the latest in cosmetic dentistry techniques. Continuing dental education has always been a great fascination and passion for Dr. Azarko as it is for all the dentists working in our clinic. Courses are taken throughout North America and Dr. Azarko also belongs to various dental organizations, both locally and internationaly. Outside the dental office, Dr. Azarko is kept busy with his wife and two children. Skiing, canoeing, bicycling, jogging, and hiking are common family activities. Racquetball, auto racing, golfing and curling are also activities that Dr. Azarko partakes in. Leisure time is for friends and family visits, videos and movies, games, and reading. When school holidays permit, he and his family enjoy traveling and exploring new surroundings. Dr. Ursula Szkudlarek is a General Dentist with many years of experience in the restoration, replacement and re-alignment of teeth. She graduated from the Faculty of Dentistry at the University of Wroclaw in Poland, and began her general practice in Edmonton shortly thereafter. Ursula is a member in good standing of the Alberta Dental Association & College and the Canadian Dental Association. Dr. Szkudlarek regularly updates her skills by attending numerous national and international conferences and courses on current and innovative dental techniques. She strives to provide her patients with the most respectful, comfortable and personable dental care and ensures that all of their oral heath needs are met. In her spare time, Dr. Szkudlarek enjoys exploring the great outdoors and pursuing her love of photography. Dr. Allan Zhang was born in China where he received his Doctor of Medicine degree in 1987 from the Hebei Medical College in Shijiazhuang, China. Thereafter, Dr. Zhang embarked upon a career in medical research, majoring in the area of immunology. This exciting and important area of medicine brought Dr. Zhang to Canada in 1993 to study immunology at the University of Manitoba. After receiving his Master’s degree in Immunology, Dr. Zhang continued his ambitious pursuit of academic excellence by entering the dental program in Faculty of Medicine and Dentistry at the University of Alberta in 1998. Dr. Zhang graduated with his third major academic degree from this program in 2002 and began a second career in dentistry, joining the Azarko Dental Group in August of 2003. Dr. Doug Johnston was born and raised in Edmonton and is a graduate of the University of Alberta. He earned a Bachelor of Science degree in Biology and Chemistry in 1986 and graduated from the Faculty of Dentistry in 1990. During the summer of 1988, Dr. Johnston conducted a research project for the Faculty of Dentistry in Biochemistry. Dr. Johnston continues to be academically ambitious, completing a minimum of 30 hours per year in continuing education courses, thereby ensuring perseverance of the current standards and trends in dentistry. Dr. Johnston began his career with the Academy Dental Group in 1990, practicing in a large group practice in downtown Edmonton for four years. 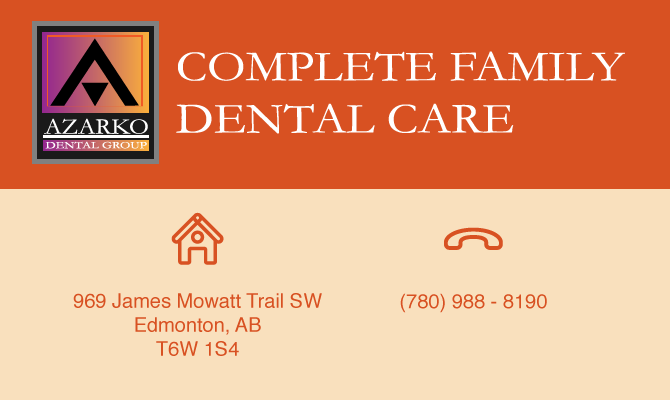 Thereafter, Dr. Johnston spent the next 11 years as a busy rural dentist in the town of Swan Hills, Alberta, before joining the Azarko Dental Group in 2005. At the age of 17, Dr. Tonny Tang entered the University of Alberta where he was granted acceptance into the Faculty of Dentistry after only two years in the Bachelor of Science program. Two years into the dentistry program, Dr. Tang earned his Bachelor of Science Degree with distinction. A graduate at 23 years of age, Dr. Tang obtained his Doctorate of Dental Surgery and was awarded the Pursuit of Excellence Award in the field of Prosthodontics as a General Dentist. Dr. Tang’s dedication to excellence and passion for artistry drive him to maintain high levels of proficiency in all areas of dentistry. He pays meticulous attention to detail and continues to hone his skills in dentistry by advancing his education through through dental courses mainly focused on all aspects of General Dentistry. These include cosmetic procedures, root canal treatment and implantology, areas in which he is particularly interested. Dr. Tanya Mundt grew up in Regina, Saskatchewan. She graduated with honours from the University of Regina with a Bachelor of Science degree in Chemistry in 2001. In 2005, she earned her Doctorate of Dental Medicine at the University of Saskatchewan’s dental college. Dr. Mundt is very family-oriented. She has a son and loves working with children. She is a patient, gentle General Dentist who strives to prevent problems before they start and provides treatment in a way that ensures happiness for each patient. Dr. Mundt is very understanding of patients who experience anxiety and is certain to provide the most comfortable treatment possible. In her free time, Dr. Mundt enjoys playing competitive soccer, bikes, and runs. She is a proud supporter of the Canadian Cancer Society, the Humane Society, and is a volunteer for the Heart and Stroke Foundation. Dr. Ng was born in Malaysia and moved to Canada in 1989, where he lived in New Brunswick and then Halifax. He completed his undergraduate studies with BSc Honors in Biochemistry at UNB. Thereafter, Dr. Ng was accepted into the dental program and earned his Doctorate of Dental Surgery at Dalhousie University. After graduation, Dr. Ng was posted to Edmonton in 2004, while serving in the Canadian Forces as a dental officer for over 10 years. Dr. Brett York is a graduate of the University of Alberta, receiving a Bachelor of Commerce degree with Distinction in 1997 and a Doctorate of Dental Surgery in 2007. After graduation Dr. York practiced dentistry in the Edmonton area for one year before moving to practice in Kelowna, British Columbia. While in British Columbia, he practiced within a large family practice and focused on oral surgery, endodontics, and surgical placement and restoration of dental implants. Dr. York spends substantial time on continuing education and places a priority on keeping at the forefront of the most current treatment in dentistry and oral surgery. In particular, Dr. York has developed a special passion to becoming proficient in the area of dental implants. Born and raised in Edmonton, Dr. Panesar earned a Bachelor of Science Degree with first-class honours in Neuroscience and a Special Certificate in Psychology from the University of Alberta. He then went on to complete a Doctorate of Dental Surgery in 2005 from the University of Western Ontario in London, Ontario. Dr. Panesar is an advocate of gentle dental care, and remains committed to excellence in dentistry.